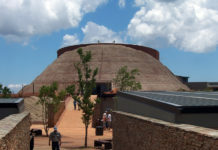 The Red Location Museum of the People’s Struggle in New Brighton, Port Elizabeth – winner of three international awards – was designed to be both a monument to South Africa’s struggle against apartheid and an integral part of community life in a township that acted as a crucible for the struggle. The museum is located in the Red Location shack settlement, New Brighton’s oldest neighbourhood, scene of one of the first public acts of defiance against apartheid when, in 1952, black railway workers refused to show their “passes” to enter railway property. The striking, industrial warehouse-styled complex uses space, oxidised corrugated iron, wood and steel to echo its shanty town surrounds – the Red Location shacks for resettled blacks, orginally constructed out of material recycled from defunct Anglo-Boer War concentration camps. The museum, which opened to the public in November 2006, has won three major international awards. In June 2006 it was awarded the Royal Institute of British Architects’ inaugural Lubetkin Prize for the most outstanding work of architecture outside the UK and Europe by a member of the institute – beating stiff competition from the Canadian War Museum in Ottawa and the Terrence Donnelly Centre in Toronto. The museum project also landed the city of Port Elizabeth the 2005 World Leadership Award for architecture and civil engineering, and the Nelson Mandela Bay Municipality the 2005/06 Dedalo Minosse International Prize for Commissioning a Building. 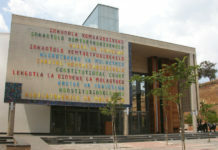 The museum complex, designed not only as a tourist attraction but also as an integral part of the surrounding community, includes an art gallery specialising in the work of Eastern Cape artists and will also house a market, a centre for creative arts, a library and adult literacy centre and a conference centre. Hundreds of new state-subsidised low-cost houses have been built in the surrounding area. The museum integrates into the existing neighborhood of former victims of apartheid as a seamless part of their daily life. “In this way, the horror of apartheid becomes more apparent simply by its calm presence in the museum side by side with a functioning community,” says architect Jo Noero of Cape Town-based Noero Wolff Architects, who designed the complex. The museum’s design draws on notions of memory to show both the horrors of institutionalised racism and the heroic efforts of the anti-apartheid movement in sharp relief. “All museums concern memory and history; it was therefore all the more impressive to encounter one in which particular histories and memories have evoked an extraordinarily powerful architectural idea,” the Lubetkin judges said. The concept of “memory boxes” – in which migrant workers on South Africa’s mines carried artefacts to remind them of their homes in the countryside – forms the basis for a building which is in itself one huge memory box. Designed in industrial form to incorporate the rusted corrugated iron – the Red Location – theme of the surrounding settlement, the museum houses steel containers tipped on end to make individual memory boxes, giving its curators a blank canvas in which to exhibit memories, responses and ideas. The most powerful of these piles of boxes, according to the judges, contain police files on those who were murdered, judicially or otherwise, during the struggle against apartheid. Above the boxes hang three nooses. 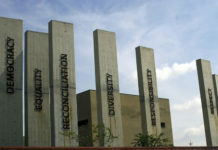 In contrast to the memory boxes, visitors to the L-shaped museum first pass through a hall of columns, designed by artists to resemble totems, honouring those who gave their lives in the struggle against apartheid.